Trump at a White House event focused on the opioid crisis. President Trump has done almost nothing to end the “American carnage” that despoils his beloved “forgotten men and women.” His health-care plan would have financed a tax cut for the rich by throwing millions of working people off of their health insurance; his proposed budget would slash funding for development and job training in rural America; and his few legislative achievements have empowered corporations to dump mining waste in streams, and steal from their employees without losing access to federal contracts. —Opioid prevention and treatment: a proposed $500 million increase in the Health and Human Services Department to counter the epidemic and more money for the Justice Department to combat the problem. But it turns out this was just another instance of Trump’s rebranding someone else’s product. The president’s budget blueprint touts “a $500 million increase above 2016 enacted levels to expand opioid misuse prevention efforts and to increase access to treatment and recovery services to help Americans who are misusing opioids get the help they need.” This caught the eye of Vox’s German Lopez, who noted that the 21st Century Cures Act — legislation signed into law by Barack Obama late last year — had already increased funding for opioid addiction treatment by $500 million over 2016’s baseline. Later Wednesday afternoon, Trump announced the launch of a new commission tasked with evaluating how federal resources can be redeployed to combat the opioid epidemic. The commission will release a preliminary report in three months and a final one in the fall. Whether the commission’s recommendations will be translated into new investment in treatment remains to be seen. But, as of now, Trump has done nothing to “expand treatment” for the “badly addicted.” If anything, he’s worked to restrict their access to treatment: The president has proposed $100 million in cuts to the Substance Abuse and Mental Health Services Administration’s mental-health block grants, which support addiction services. 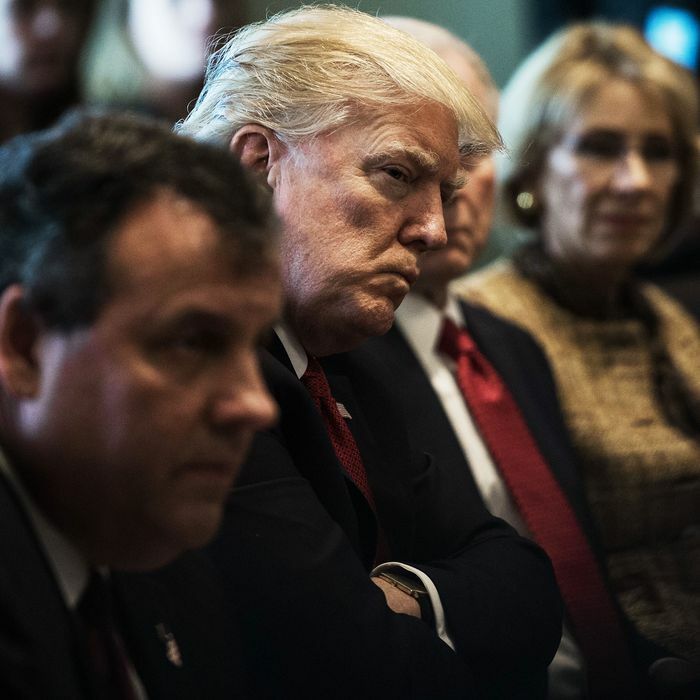 Drug overdoses killed more Americans last year than HIV did in the worst year of the AIDS crisis — and all the Trump administration has given to the communities devastated by the opioid epidemic, thus far, is Christopher James Christie.